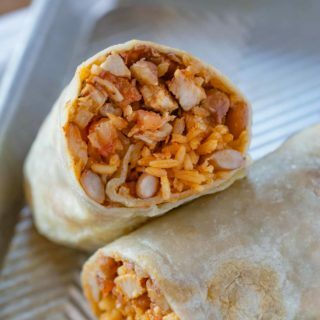 Chicken Burrito is the PERFECT grab-and-go meal made with chicken breast, Mexican rice, refried beans, cheddar cheese, and seasoning, wrapped in a flour tortilla and frozen until you need it! Add the canola oil to a cast iron skillet on medium heat, season the chicken with salt and cook for 4-5 minutes on each side before removing from the pan and adding in the onion and garlic to skillet, cooking for 1-2 minutes. Add tomato paste, cumin, chili powder, oregano, salt, lime juice and water. Cook and stir until mixture comes to a slight boil. Reduce heat to low and cook for 5 to 8 minutes or until thoroughly heated while you chop the chicken finely and add it back into the pan to cook down with the mixture. Lay tortillas out on a flat surface and divide the beans, chicken, rice, cheddar cheese and sour cream among the 8 tortillas. Fold each burrito-style. To Reheat: Unwrap burrito from plastic wrap. Place on a microwave-safe plate. Microwave 2 to 3 minutes or until heated through.